This weekend, the creators of Different for Girls will visit ClexaCon London. It was quite weird to me that I had never heard of this UK lesbian web series before, especially since Rachel Shelley is in it, who is my favorite The L Word actor. They were kind enough to send me a screener of the show so that I could properly prepare for ClexaCon London. I liked it so much that I thought I would share it here with you. I cannot be the only one who missed this show, can I? Different for Girls first was a book written by Jacquie Lawrence. You can find it on Amazon. It is funny; if you read the reviews, the reviewers often say that they want to see the book adapted to the screen or turned into a web series. Well, Jacquie Lawrence did just that. According to Lesbian Box Office, which is a channel dedicated to programming lesbian and bisexual women’s content set up by Jacquie and Fizz Milton, Jacquie realized that there had not been a lesbian-specific drama on British television since 2010 (Lip Service). Jacquie and Fizz understood that the only way to watch a drama with lesbian content was to make it themselves. And so, the 2015 book turned into this three-part web series in 2017. If you search for Different for Girls online, you will find articles describing the show as ‘your new favorite lesbian soap opera,’ ‘the antidote to TV’s treatment of LGBT characters,’ and ‘addictive & mesmerizing.’ Now that makes me feel even more stupid for not knowing about Different for Girls, but let us not dwell on that. The show starts in an incredibly confusing way. In the first fifteen minutes, you will see some fight, love, drug use, and vomiting scenes rapidly succeeding each other. In these scenes, you will meet every character on the show. To be clear, there are quite a few characters on the show. The Amazon reviewers are right when they said they needed some time to figure out who was who and who was dating whom. Still, you immediately know that this something you want to get into. You want to know the answers to who is who and what is happening. There is much information to process but the rest of the show will slowly make it clear to you. Also, rewatching the first fifteen minutes after watching the entire series is helpful. I am so very, very happy that this show revolves around women my age. If you want to know, I am in my thirties. I usually have to watch teens or people in their twenties when I want to watch a lesbian-themed show. That is fun but at the same time, it seems like the moment I got married and had a kid, I gave up on an exciting life. Apparently, content creators do not think we can handle adventures after we had our thirtieth birthday or wedding day. That being said, I do feel sad that when you finally see two married women, the story centers around cheating and being cheated on. Where are our adventures? Still, I understand that the other storylines revolve mostly around relationships too, so it is not like they saved that for the married women. Also, I sometimes felt moments of the storylines were a little far-fetched. I now understand why some would call Different for Girls a soap opera. So much is happening in such a short amount of time. I noticed that I did feel inclined to ask myself the questions of would I or would I not? How would I respond in these situations? That means I was still emotionally involved, so that proves the quality of this web series and the incredibly talented actors. 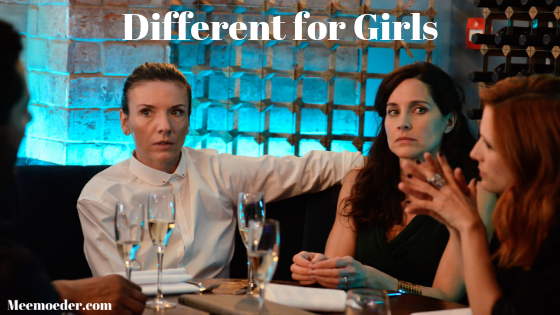 The story leaves a few openings for another season of Different for Girls. I honestly would like to see the second season of this web series. Who knows, I might be able to find out more at ClexaCon London. You can watch Different for Girls on Lesbian Box Office, where you can rent or buy it. I hope can show you some ClexaCon Different for Girls footage on my YouTube channel in a few weeks, so make sure to subscribe! Update February 19, 2019: Here, you can read my interview with the writer and producer of Different for Girls.